Thread: Where to shoot in Mountain Top?? Are there any spots to shoot outdoors in Mountain Top? I would have to drive 45 min to either range, and shooting a pistol at 50 and 100 yds. is really kind of pointless. I'm looking for a place where I can do close range target shooting. Thanks! Re: Where to shoot in Mountain Top?? if you are looking for an actual range, GOOD LUCK. Yes I have had several so called experts try and act like a know it all. I was shooting my Sig 232 and this moron comes over to ask what I was using. When I said a Sig 380, right away he was an expert. Telling me how the are not reliable, unaccurate, all the time he kept saying my 239 in 380 was a poor purchase on my part. By the way he was shooting a Bersa 380, brought from Bob's sporting goods. He relied on Bob's recommendation because Bob's an expert. This clown couldn't even load the gun safely, he was standing behind his friend trying to chamber a round. Needless to say this was my last visit to a state game land. On one hand, the PGC really screwed the pooch when it comes to their handgun ranges. I used to like the one off of Rt 118 which at least had a 15yd backstop, but............they did away with that when they re-did the range. On the other hand, after seeing how badly some "shooters" tore up the 2x4's, etc at the 15yd line, I can only imagine how bad they would shoot them up if the PGC put in a 7 or 10yd line set up. I am patiently waiting for Advanced Arms to get their indoor range set up....hopefully in the near future. I think when they find the proper building, they will have a gold mine on their hands. 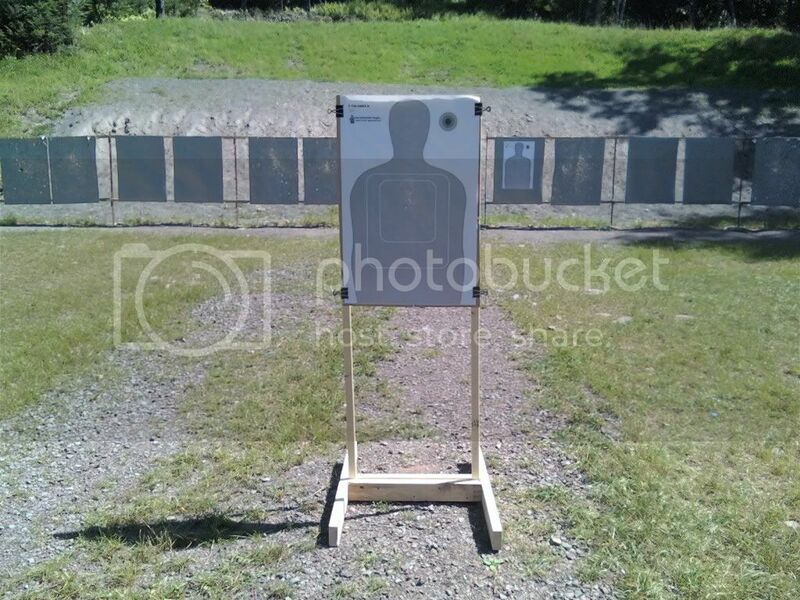 i had no idea that you weren't allowed to get closer than 25 yards at SGL ranges. i knew about the mag limits, but i frequently practice from 10' to 30' away. i really didn't know about that rule. and, i still don't know it. The PGC rules & regs for the SGL ranges say that you can only shoot from the firing points, so you really aren't supposed to walk down closer to the targets. And.....I forget the exact wording, but you can only shoot at the in place target areas. Bringing something to place closer is considered a no-no. I made several of these for when I qual/train my dept, and keep a spare one at home. While I can shoot from the 25yd line, my wife has some difficulty, plus its not very practical to be limited to 25yds. We've been lucky, as we usually try and go during the week when very few people are there. I found a place outside of Hazleton to shoot. It's in stockton on twnship highway 319 and is before you get to hazlebrook. It's off the road up a steep path about 50 yards, then there's a huge open area of about 100-150 yards. Looks like the area was cleared at one point and there's a big high berm as a backstop. A guy I worked with while I was in highschool told me about this place, and its obvious the place is used by other people too, I always see fresh garbage around. There's no posted signs or anything either, how do I know if it's legal for me to practice there? Ok, so there's no place to shoot in this area besides the ranges? How about off in the woods somewhere like at the bottom of 309 through the mountain?? ARE THERE MOUNTAIN LIONS IN PA? NOW I KNOW THERE ARE MOUNTAIN LIONS IN PA.